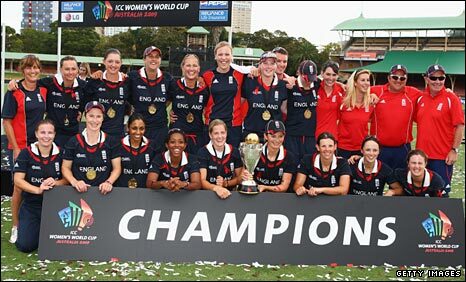 England outclassed New Zealand to win the Women's World Cup with a thrilling four-wicket victory in Sydney. Nicky Shaw, a late replacement for the injured Jenny Gunn, was the unlikely hero, claiming 4-34 as the Kiwis were dismissed for 166 in 47.2 overs. Openers Sarah Taylor (39) and Caroline Atkins (40) calmly took England to within touching distance of the target. England wobbled slightly - losing five wickets for 40 runs - but won with relative ease despite a nervy finish. It was left to player of the match Shaw (17 not out) and Holly Colvin to steer the team over the finishing line, with the former hitting two timely boundaries to ease the tension when the pressure had seemed to be getting to England. However, had it not been for the plucky Lucy Doolan, who hit a swashbuckling 48 for New Zealand and claimed 3-23, then England's victory would arguably have been trouble-free. Taylor, Atkins and captain Charlotte Edwards (10) all fell prey to the 21-year-old's off-spin as Doolan added a touch of intrigue to a match which, for the most part, seemed like an England procession. Aimee Mason's removal of Lydia Greenway and the sloppy run-out of Beth Morgan, which left England on 149-6, ensured it was not a totally nerveless win. But England's success had been shaped in the field where the clinical fashion in which the Kiwis were dismissed allowed for some breathing space despite a batting blip. 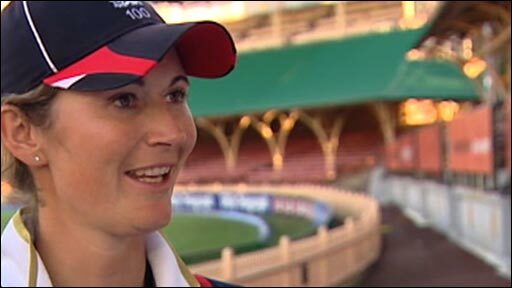 Shaw, who only learnt of her inclusion in the team 10 minutes before play when Gunn pulled out because of a calf injury sustained during the warm-up, was particularly impressive with her seam bowling. The 27-year-old proved to be more than an able deputy as her burst of three wickets in her opening three overs set England on their way to an historic victory. While it is the third time England have lifted the trophy, this win on a gloriously sunny day at the North Sydney Oval is the first time they have done so on foreign soil. The triumph is the culmination of a golden year for England's women - which started with the retention of the Ashes down under last winter - and the manner in which it was achieved is testimony to the professionalism of the squad. A superb opening spell by seamer Katherine Brunt ensured England held a firm grip on the game from the very start. The first wicket to go was that of Kate Pulford , who cut Isa Guha straight to Claire Taylor, standing at gully, to leave New Zealand on 26-1. But it was the introduction of Shaw which proved to be a turning point as she claimed two wickets in as many balls in her first over to leave the White Ferns reeling on 49-3. Suzie Bates - the scorer of an astonishing 168 against Pakistan in New Zealand's previous match - was the first to go for just two, trying to hit over the top only to find Atkins at mid-on, while left-hander Amy Satterthwaite immediately followed, edging to keeper Sarah Taylor. Shaw struck again in the 15th over with the wicket of captain Haidee Tiffen, who had looked dangerous before she was caught by Taylor for 30. And, at 74-5, the Kiwis were in serious trouble as Sara McGlashan became Colvin's 50th one-day international victim. McGlashan had looked in fine touch, hitting an aggressive 21 from 20 balls, before she was caught at mid-wicket by Greenway. The sixth wicket soon fell with Laura Marsh bowling Mason (13) before Brunt returned to the attack in the 29th over and found the edge to send Sarah Tsukigawa back to the pavilion. Doolan and Nicola Browne brought some stability to the New Zealand innings, with Doolan carving some fine shots. However, when Doolan was dismissed by Marsh in the 45th over the wickets tumbled, with Edwards trapping Sophie Devine lbw for a duck and Shaw getting Browne (25) lbw. England's next test is the Women's World Twenty20, which takes place on home soil in June - alongside the men's competition.